I have been taunted yet again by more cravings, this time it has been cinnamon. It feels like I am smelling it everywhere. I am starting to wonder whether the mind has the capability to crave something so strong that it can trick you into smelling something that’s not really real. All I know is that it has been on my mind all day and the smell is following me wherever I go. This might be a long and convoluted thinking process, but I saw a recipe in the paper yesterday for a savoury pull apart with filo pastry (clever idea, will have to try it and let you know), but the pull apart concept made me think of pull apart bread, which in turn made me think of having something that can be torn apart and is loaded with cinnamon. 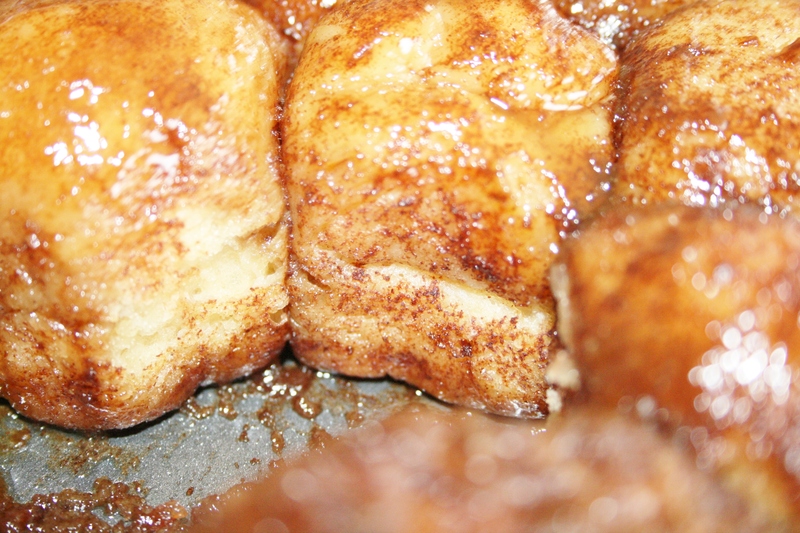 But not something like my sticky cinnamon buns, something more fluffier and more cinnamony. 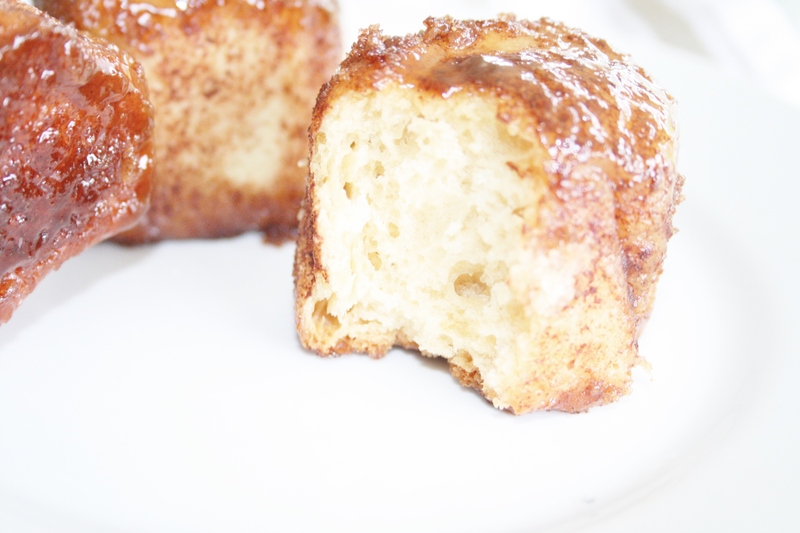 So then I thought maybe cinnamon brioche…but I only want the fluffy cinnamon centre – not the whole brioche bun. And it might be a tad wasteful to bake a whole batch of brioche buns only to remove the fluffy centres and discard the rest. Weird perhaps, but that’s the thing about cravings I am realising, they’re meant to be weird. (Right?) So then I started thinking (or more day dreaming) about a whole pan full of fluffy brioche centres, perhaps even covered in some sort of caramel. Mmmmmm can such a thing be created? Surely. 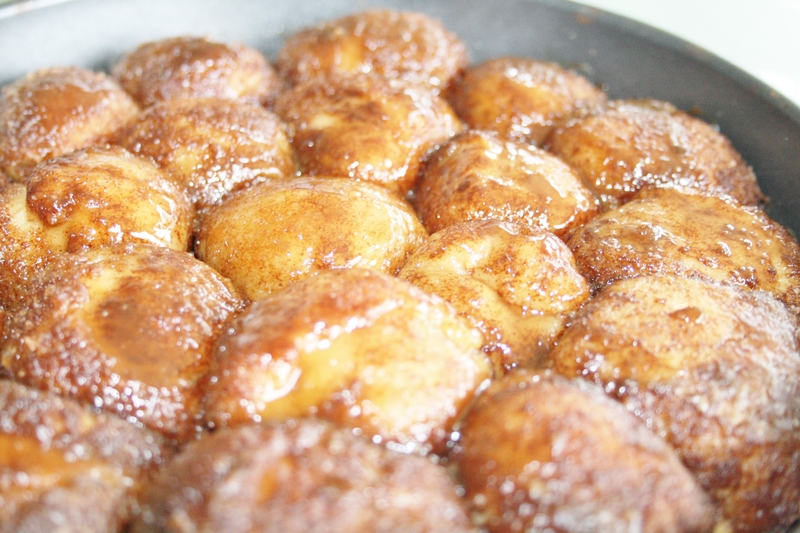 And so another pregnancy craved recipe is born, and I am calling it Cinnamon Pops with Sticky Toffee Sauce. 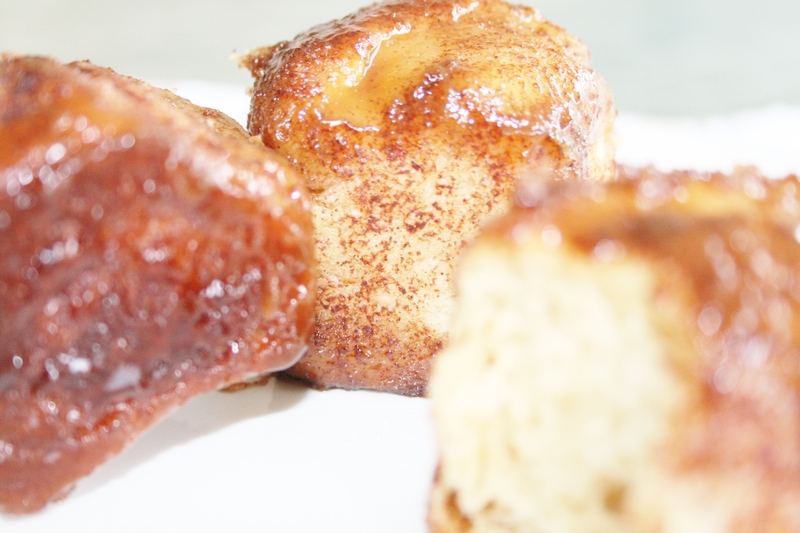 The recipe is a combination between a cinnamon bun and a brioche, the difference you ask? A brioche has about twice the amount of butter than a cinnamon bun and bordering more on a pastry. So I didn’t want the cinnamon pops to be quite so indulgent, but still needed maximum fluff factor which is caused by the butter to flour ratio. 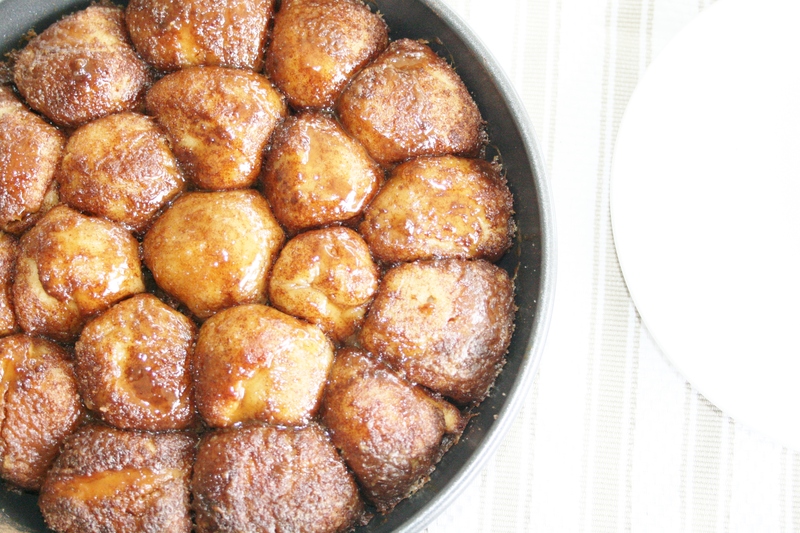 My search on the world wide web for something similar to my cinnamon pops got me stumbling across something called Monkey Bread. Apparently, if you are American you will know exactly what that is (if you’re not you need to google it! ), whereas this amazing phenomena seems to have been kept a secret to the rest of us over on this side of the world. So I borrowed their idea of rolling each pop in butter and then cinnamon sugar before baking to ensure a sugary cinnamon hit with every bite. Making the dough can be a labour of love if you are kneading it by hand, but if you have a stand mixer with a dough hook attachment it will be no effort at all. For this dough recipe all the ingredients except for the butter is kneaded together to form a soft dough (about 10 minutes if using the stand mixer). The butter is then added, small knob at a time, don’t be alarmed if it looks like the dough is getting too ‘wet’ from the butter being added. And although you may be super tempted to add more flour, resist the urge and keeping on kneading before adding the next knob of butter, the dough comes back together each time. As with any recipe using yeast, the only downside is the waiting time, and I’m afraid this one is no different. After the butter has been fully incorporated the dough needs to rest for about an hour in a warm place, or a few hours in a cooler place, until it has roughly doubled in size. I use my oven for this by heating it up at 180°C for only a few minutes then turning it off again before placing the bowl of dough (covered with a tea towel) inside. I rolled out 20 little balls to fit a 24cm round tin and then I had some dough left over to make two normal sized brioche buns in a muffin tin. This was for my good husband, who didn’t quite get my crazed idea about fluffy centres and told me that he loves the whole brioche bun, not only the centres. To make the dough: Stir the instant yeast into the cup of lukewarm milk and leave to stand until frothy, about 5 minutes. In the bowl of your stand mixer combine the flour, salt and brown sugar and make a well in the centre. When the yeast and milk mixture is ready, stir in the vanilla extract and pour into the flour mixture. Add the egg yolks and start mixing together (with the dough hook attachment) on a low speed to incorporate all the ingredients. Increase the speed slightly and start kneading the dough until soft and springy, about 10 minutes. Start adding the butter, a small knob at a time, and knead until fully incorporated before adding the next knob of butter. Once all the butter has been incorporated you will have a nice soft dough which is ready to be rested. Cover the dough with cling wrap and a tea towel and place in a warm place for about an hour, or a few hours in a cooler place, until the dough has roughly doubled in size. To make the cinnamon coating: Combine the sugar and cinnamon in a small bowl and have the melted butter ready in a separate bowl. When the dough has doubled in size start rolling it into 20 small balls about 4cm in width to fit a 24cm round tin (the sugar coating gets a bit messy so I would recommend rolling out all the little balls first). Start rolling each ball in the melted butter, then transfer to the cinnamon sugar and roll around until the whole ball is coated. Place in the centre of a greased round tin. Repeat with all the little balls packing them snuggly into the pan. Cover loosely with tin foil and place in the preheated oven. Bake for 25 minutes and remove from the oven to pour the sticky toffee all over. To make the sticky toffee: Melt together the dark brown sugar and butter over a medium heat and bring to the boil for approximately two minutes. Stir in the cream and cook for a further minute and remove from the heat. When the cinnamon pops come out of the oven pour the sticky toffee all over and put back into the oven for a further 5 minutes. The cinnamon pops should bake for thirty minutes in total, and a test skewer should come out clean at the end of this time. If it doesn’t put back into the oven for another 5 minutes and test it again. Serve immediately. These little pops really are best eaten on the day they are made. If you are keeping them longer place in an airtight container and heat up in the microwave before serving. This looks delicious. Even though I am on a diet, on one of my reward days I am going to have to use this recipe. Thanks for the great post. Thank you so much 🙂 sugar and cinnamon sure is a winning combination!! Yum! These look absolutely scrumptious, thanks for sharing!